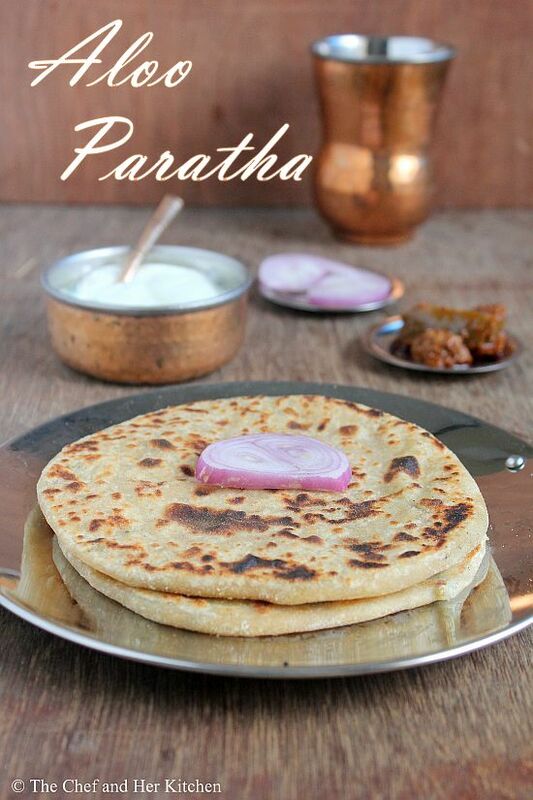 When I think of Paratha, the first and foremost that comes to my mind is Aloo ka Paratha (Stuffed Potato Paratha aka Alu Paratha). 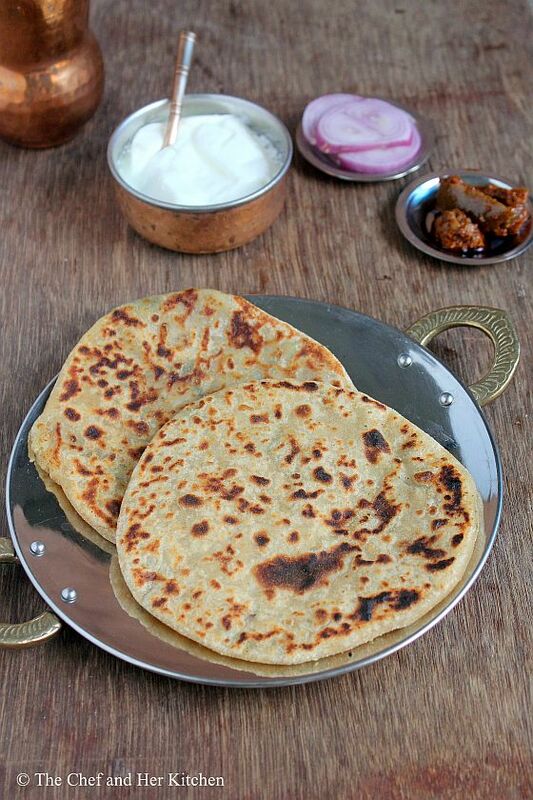 Among all the Paratha varieties, I like this classic Aloo Paratha the most .I don't like the thinly rolled, lean looking parathas which we get in south,in fact it doesn't give any satisfaction of eating a Paratha.I love the parathas when it is made in typical Punjabi style-where the Parathas are made plumpy and loaded with fresh and simple spices.However, I do not add more butter or ghee to the parathas as the Punjabi's do,but if you are not bothered about calories, you can go a bit easy on ghee/butter,it tastes really delicious.I was amazed to see how my Punjabi friend served the ghee roasted Aloo parathas with a tub of butter on the breakfast table. 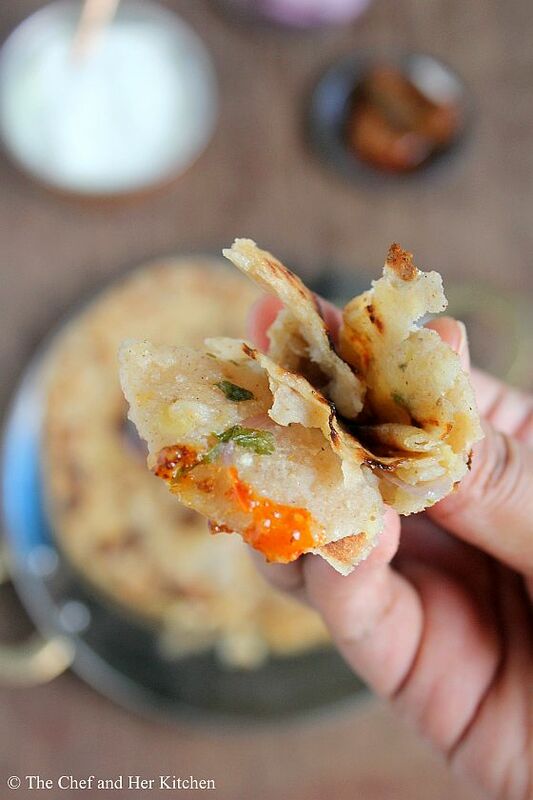 The mixture of mashed potatoes makes the Aloo paratha extremely soft and the fresh spices and butter/ghee add an extra taste to it.I like to add coarsely crushed coriander seeds instead of coriander powder to the potato stuffing and also use larger quantities of ginger and green chillies in the recipe as I am fond of that masaledar taste. In a bowl add wheat flour and add required salt and 1 tsp oil and mix well. 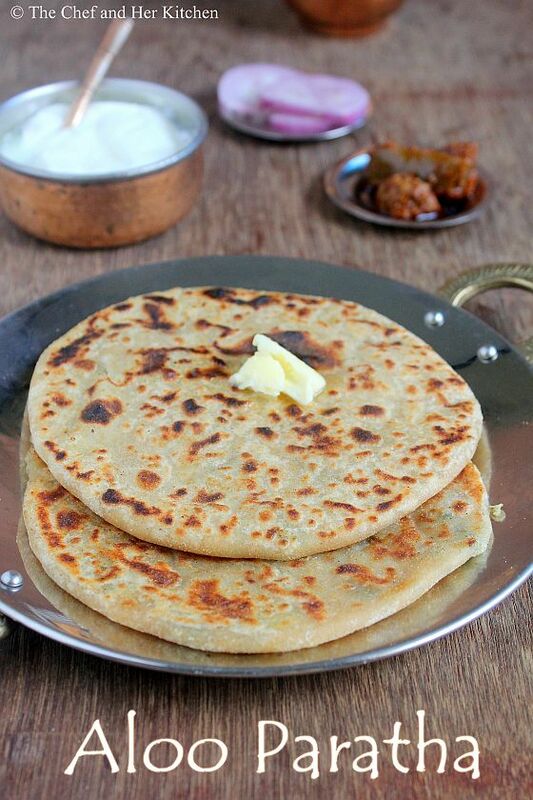 Add little water(if needed) and knead it into a smooth and soft dough.The dough should be slightly softer than the regular chapati dough for parathas as it will not only make easy to stuff the filling it will help in easy and even rolling of parathas. Apply oil on top of the dough and cover it and keep it aside for at least half an hour. Grate the boiled potatoes and put it in to the bowl. Add finely chopped green chillies,onion,grated ginger,chopped coriander and mix well. Add amchur powder, salt, coarsely ground coriander seeds and cumin powder and mix well and keep it ready. Pinch the dough and take a big size lemon sized dough and place the dough in your left hand palm. Dip your right hand fingers in the flour and try to make a cup shape(which can hold 3-4 tbsp filling) out of the dough by moving your fingers pressing with the thumb in the center.Take care that the edges should be slightly thinner and in the center it should be thick. Fill the cup with 3-4 tbsp filling and seal the two sides of the dough(it would look like Karanji now) and gently press the corners to get a big round ball out of it.See the pictures for better idea. 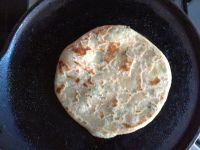 If you stuff the filling in the dough in this way you will get evenly filled paratha and it also forms like pocket.If you find all the above process bit difficult,you can easily roll a 3" circle out of the dough and place the filling in the center and pleat the dough and seal it by gathering the dough around the edges. Slightly flatten the dough(stuffed with filling) with hands and dip it in the wheat flour and gently roll it to a 6" disc of 1/2" thickness.You should not apply more pressure while rolling,so roll it gently.If you apply pressure the stuffing would come out. Flip it on to a hot tawa and fry it until you see bubbles. Turn it and apply oil/ghee and fry and then turn and apply oil/ghee on the other side.Roast until you get golden colored slightly crisp parathas.Mine got bit over roasted as I was doing multitasking at that time. 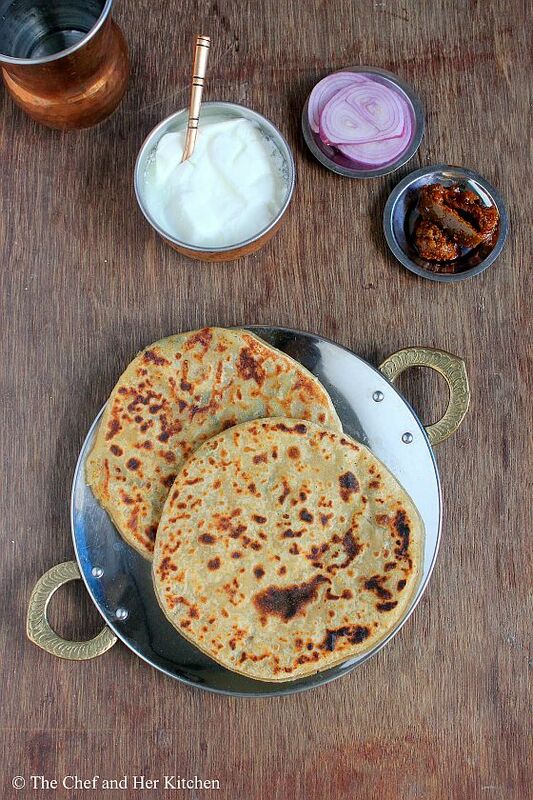 Fry the parathas on both sides until you get crisp brown patches on both sides. Serve them piping hot with a blob of butter and Aam ka Achar/Mirch ka Achaar or Mixed Vegetable Achar , curd/masala dahi and sliced onions. 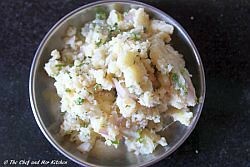 You can even do a combination of mashed boiled aloo and gobi or gobi and mooli(radish) in the recipe. Aloo can be replaced with grated paneer or grated and squeezed gobi or radish and follow the same recipe,it tastes nice too. I like to add coarsely crushed coriander seeds instead of coriander powder to the potato stuffing and also use more quantity of ginger and green chillies in the recipe as I am fond of that taste. You can also try adding coarsely crushed dry pomegranate seeds(anardana) for a different taste. 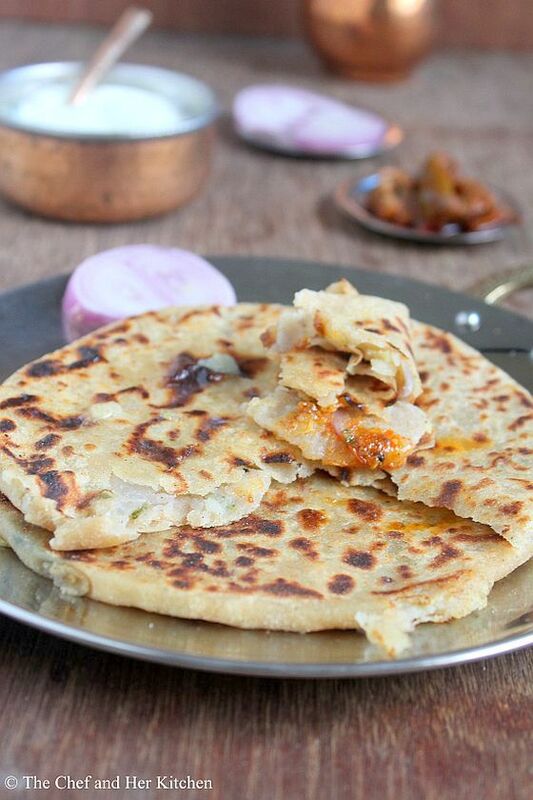 Aloo Paratha is just inviting me, irresistible they are..